These adorable little Easter Baskets crochet up quickly and are a decorative addition to each place setting on Easter. The free pattern is from Lion Brand. I adjusted the directions to make a basket with straight sides. And some Easter candy and you are all set. I also bagged my baskets. labeled them and will use them for "place cards" at each table setting. These little baskets are so cute, and versatile! Thanks for the pattern link. They are so cute! And they look fabulous with the colored grass. Thank you for sharing! adorable baskets!! pinning and saving! I am stunned! How precious are these baskets!!! I can't believe you made ALL of them..... Adorable!!! These are just so cute! Thanks for stopping by to share on Hopping Along to Easter. I am pinning these. Also wanted to tell you that you are this week's Featured Host for Hopping Along to Easter. Could you please email me at kewkew34@yahoo.com. I will just be featuring this post and linking back here. You will get to host the post/linky on your blog as well. Please put Hopping Along to Easter in the subject line so I can find it easily. The post will need to go live any time between midnight and noon on Sunday the 6th. These are so cute! Visiting from Wake Up Wednesday Linky Party! These are so adorable and I love the look of them. Thanks for linking up at Sunday Soiree! 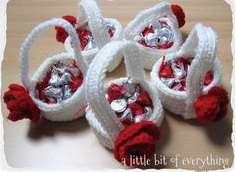 Your crocheted easter baskets are so pretty and you did a nice job making so many! Have a nice weekend and congrats on the feature at rooted in thyme!